Doctors at Al-Matariyya Hospital in Cairo walked out on strike for a week in defence of colleagues who were assaulted by policemen for refusing to write false reports about a patient’s injuries. The strike began after a van of policemen arrived at the hospital on 28 January, Doctor’s Union secretary-general Mona Mina told Egyptian news site, Mada Masr. They told doctors to falsify medical reports, and then seized two doctors, who “were abducted from the hospital by policemen and dragged into the microbus, where they were handcuffed and transported to Matareya Police Station”, Mina said. In response to the incident, medical staff walked out on strike, closing the hospital for a week. 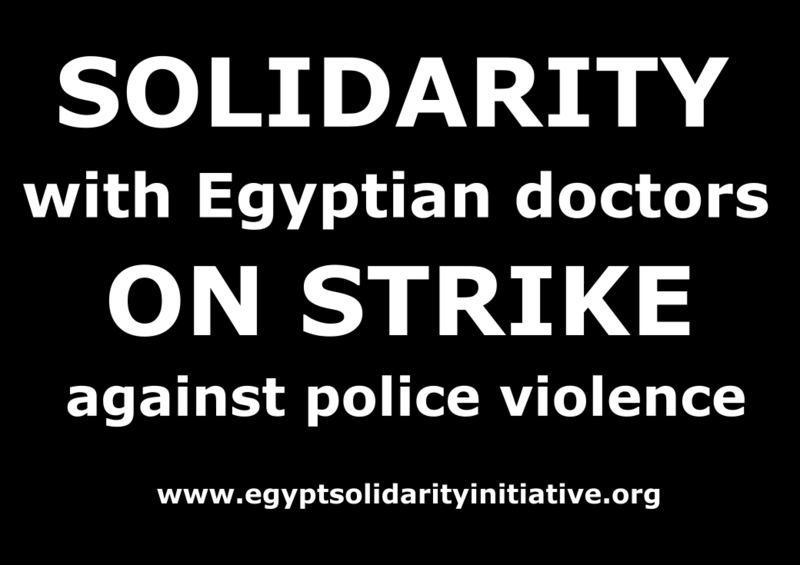 Although the two doctors were reportedly forced to drop individual complaints about police intimidation, following pressure from the Interior Ministry, they won strong support from the Egyptian Doctors’ Union. The union threatened national strike action over the issue, and was set to debate a motion in its general assembly on 12 February for a walkout in protest at police intimidation and assaults on doctors. The Al-Mattariyya doctors’ strike also won widespread support outside the health service, with messages of support from the Journalists’ Union, the Engineers Union, the Lawyers’ union and from media personalities such as the broadcaster Bassem Yousef. Take action in solidarity with Egyptian doctors’ union activist Taher Mokhtar who was arrested last month.